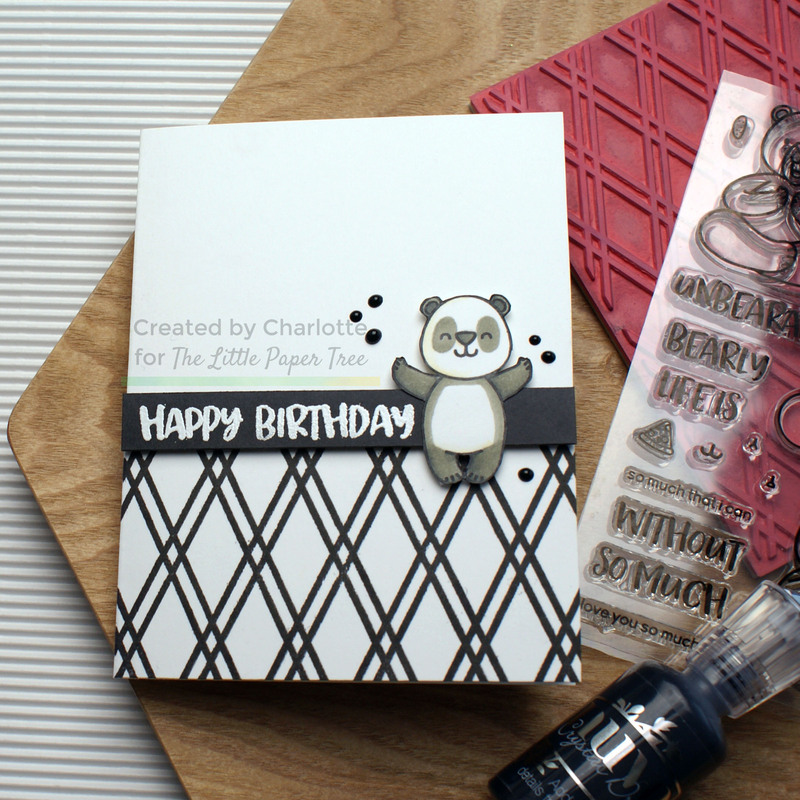 In my latest video for The Little Paper Tree I decided to play with adding simple details to a stamp, then used it to make a fun monochrome birthday card. I did have some technical issues with the video (my camera kept cutting off!) but it was a pretty simple card to make and I hope you’ll enjoy what you saw of the video. We’d love it if you subscribe both to my YouTube channel and The Little Paper Tree’s channel. Just a head’s up – I will be having a giveaway on my channel soon to celebrate reaching 1000 subscribers! The stamp image I am adding detail to for this card is one from Heffy Doodle’s Unbearable Without You stamp set. I stamped it with MFT Black Licorice Hybrid ink onto Neenah Solar White 80lb card stock, then coloured with my Spectrum Noir Illustrator markers. I chose my darkest greys to colour the ears, arms and legs, the outer areas of the body, and of course the spots around the eyes. I then bought in a light cream to add shading to the white areas of the body. Once the colouring was completed I fussy cut the image out, went along the cut edges with a black, water-based brush marker, and set it to one side. Next I worked on my background. I used the Catherine Pooler BFF Background stamp and stamped it directly onto my card base which is made from Neenah Solar White 110lb card stock. I masked the card base so that only the bottom portion would be stamped, and used Altenew Jet Black ink for a crisp black impression. I then took a snippet of black card stock and stamped a sentiment from Heffy Doodle’s Happy Snappy Crocs with embossing ink before heat embossing in white. I trimmed the sentiment panel down with my paper trimmer. Then I used Tombow Mono Multi Liquid Glue to adhere my fussy cut panda onto the sentiment strip. 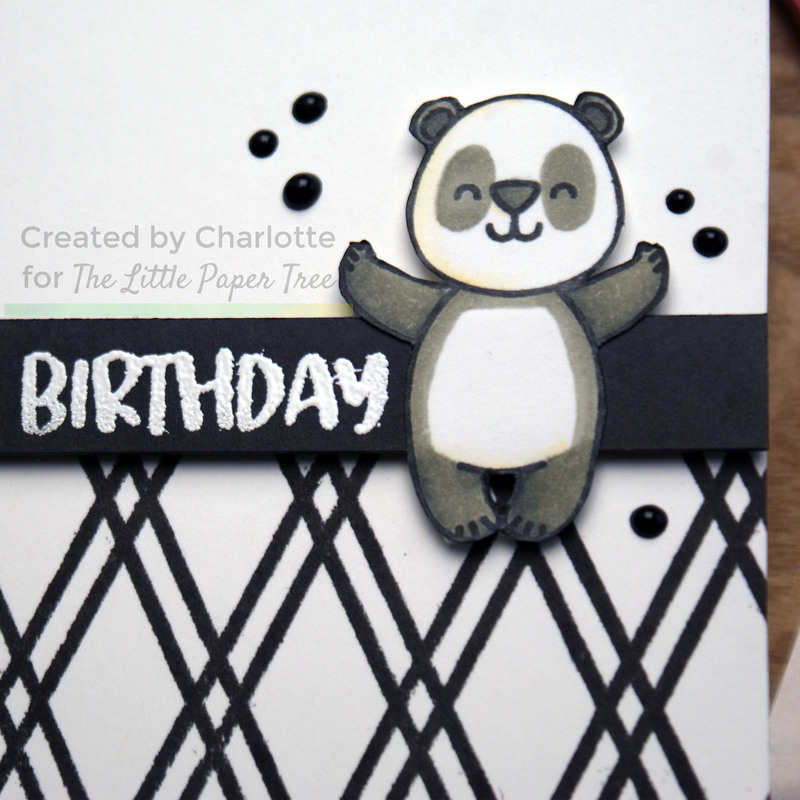 I added foam squares to the back of both the sentiment strip and the overhanging areas of the panda and lined it up onto my card base over the edge of my stamping. As a final touch I took some Ebony Black Nuvo Drops and added just a few around the panda for a bit of added interest. I’m really pleased with how this fun black and white birthday card turned out. I enjoyed adding the simple additions to the bear stamp to turn it into a panda, and it’s a great way to get more versatility from the stamp. The monochrome colour scheme adds elegance to the card and makes it very striking. Such a cute card! Thanks for joining us at Aloha Fridays! Wonderful CAS card Charlotte! It’s so cute and striking. This is so adorable! You rocked it on the black and white challenge. Thanks for playing along with Seize the Birthday.